The new boundary conditions will be additionally useful for other applications where having velocity profiles at inlet boundaries is desirable by eliminating the need for extra modeling space for flow development. A rating curve is a cross-sectional river characteristic which relates the fluid elevation to the discharge flow in the river. The Rating-Curve boundary condition allows the user to specify rating curves for both inlet and outlet boundary types. The rating curve condition can be defined in addition to a time-dependent “volume flow rate” boundary condition. This makes it more convenient for modeling a flood wave scenario by eliminating the need for manual input of time-dependent fluid elevation data. With a rating curve BC on an outlet it is also no longer necessary to specify a time-dependent pressure on the outlet. The rating curve always gives the fluid elevation corresponding to the simulated volume flow rate integrated over the boundary. This allows users having a wave deformation related outlet boundary condition for the free surface elevation. FLOW-3D has the capability to read external files having more than 500 data points specified as input information. This allows the input of very accurate rating curves for any arbitrary river profile. This video shows an example of a flood wave simulation. The inlet boundary condition has a rating curve that is producing a super-critical flow associated with an incident flood wave. The outlet has a rating curve boundary condition for sub-critical flow. This combination of boundary conditions, with the time-dependent flood wave at the inlet causes the formation of a hydraulic jump in the modeled domain. The four charts show the variation in fluid elevations at the boundaries corresponding to the changing volume flow rate. If only the flow rate of a river is known on an inlet boundary, and no information about the fluid elevation is available, then the new boundary type Only Discharge could be selected for the inlet. FLOW-3D then sets a fluid elevation in accordance to the flow situation in the domain adjacent to the inlet boundary area. The only input the user has to provide, in addition to the volume discharge rate (time dependent or not), is a minimum fluid elevation. The minimum fluid elevation is used, for example, as a way of preventing the change of the flow regime from sub-critical to a super critical regime. This video shows the same setup as the previous video except that the inlet boundary has been changed to a sub-critical, volume flow rate. Since the inlet is no longer forcing a super-critical flow the modeled domain maintains a sub-critical flow condition throughout. 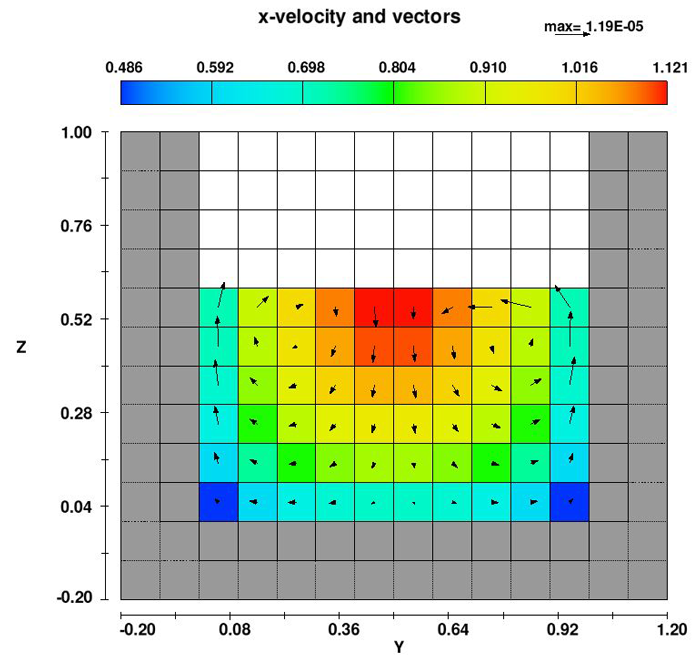 All the newly- implemented boundary conditions have a velocity profile that is uniform over the boundary condition face. To reduce the “profile-development-length” is the goal of a third new type of hydraulic boundary conditions, the Inlet Profile, which is currently under development.